Bonjour! Je suis en France. And as per usual this means blogging takes a back seat to complete relaxation. Eating and relaxation in fact. As we speak I am feasting on cherry compote with fromage frais with one hand and writing this with the other. One of the great joys of being in France is eating – as much and as highly calorific food as I can. The other joy is wandering around, looking at all my finished projects. Taking a little mental walk down memory lane. And I thought I might take you on a stroll with me on this blog post using textures and fabric to tell the stories. Or at least to kick start them. This is our hallway. Smooth huh? The walls in La Maison Blanche are not smooth. They are in fact the exact opposite. Craggy, lumpy, bumpy, like wall cellulite in fact – everywhere. And although some were so bad we had to replaster them, most. like this have been painted over and left. Lumpy. Peter insists this adds to the house’s character. I’d truthfully like to plaster them all up a bit and at least make the edges a bit neater but as he’s the one doing the work I can’t really do much about it. 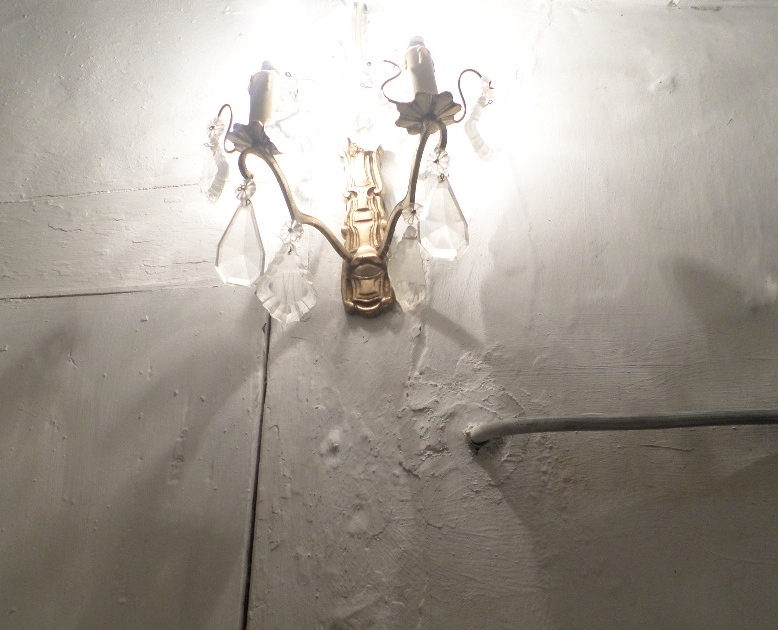 This wall is half way up the first flight of stairs and I bought the light in one of the first Vide Greniers we ever went to. There is a door on this wall. I have never been beyond it. There are lots of these in our house – doors leading to attics – which sound like romantic, hidey holes for children to play in. If CS Lewis were writing this blog post we’d all be in there discovering secret lands and faraway adventures. But sadly – they are just dark, cobwebby attics probably full or rats or bats or both. Marble plus mirror in my bedroom. A very early purchase and for bigger pics of the bedroom cick here. 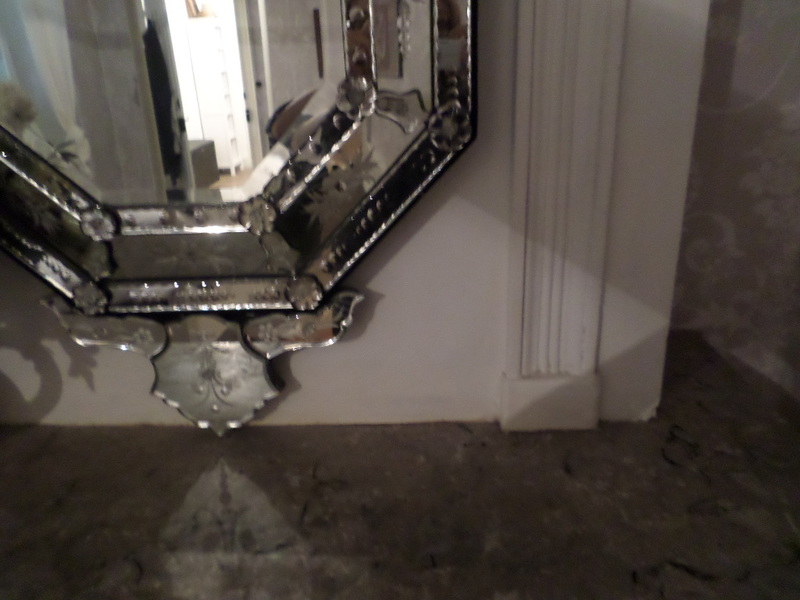 This mirror came from my favourite shopping destination – ebay…..and I have always wanted one just like it. They are however very expensive – but this one wasn’t because it was broken. There were a couple of pieces of glass which had fallen off the mirror so the vender couldn’t charge much for it and no one else wanted it. And when it arrived, Peter simply glued the broken pieces back on and voila. My dream mirror. The marble fireplace in our bedroom is the original fireplace and very grand. But our only attempts to actually light a fire in it ended in us being smoked out of our bedroom, eyes streaming, gasping with smoke inhalation as opposed to sitting gazing into each other’s eye’s romantically in front of it. These are our dining chairs. Which Peter upholstered himself. Each morning he likes to get up early. I am never sure if this is simply a way of getting time alone before everyone else gets up or wether his body clock is wired differently to everyone else in the world . If he’d been married to Margaret Thatcher they’d have been always bumping into each other at 4am – her deciding wether to defend small island nations, him wielding an upholstery gun. Anyway, I love these chairs. I barely let people sit on them I love them so much. And they populate my dining room which is the best room in the house. And now my own personal homage to the Metro Tile. The budget conscious renovators best friend. Which is lucky because I love them. And if you can’t use a Metro tile in France then where can you (unless of course these tiles were so named because of the Newcastle Metro – whay aye) These ones came from Topps Tiles and we drove them over in the back of our estate with the back end dragging along the motorway! I think the real trick to make metro tiles more interesting is to get a coloured grout. 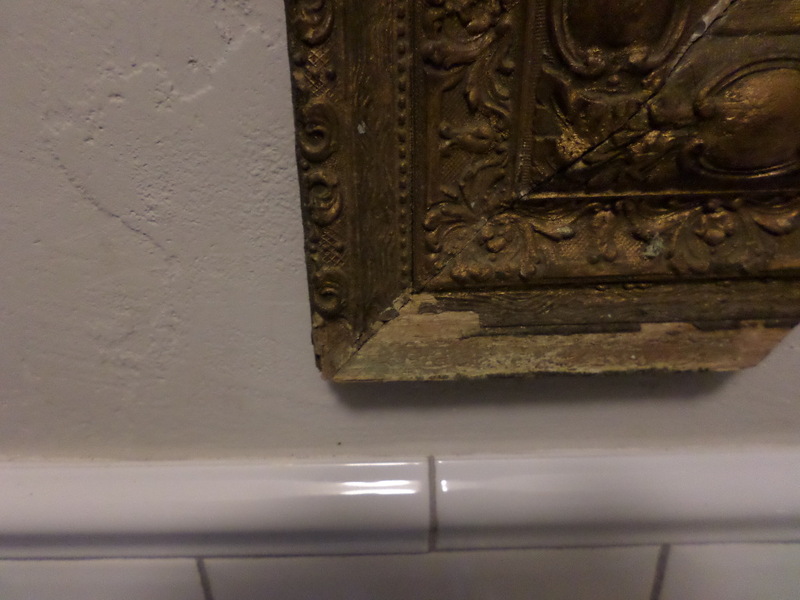 In Jamie Olivers Italian near us they have orange grout in between which looks really cool. Though taking loo inspo from restaurants can be dodgy as before you know it you’ve ended up with your home looking like Nandos! 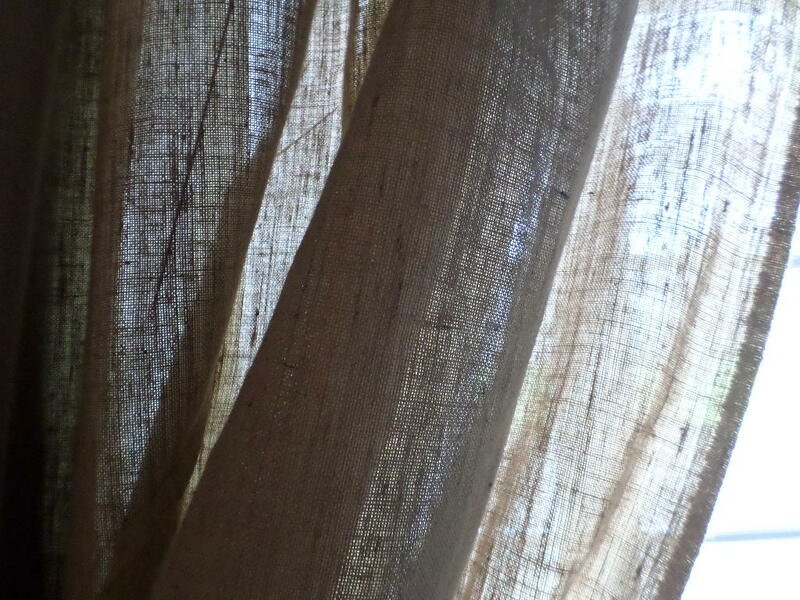 These are my home made curtains. I am very proud of them as I’d never made curtains before. If you look really closely it turns out I’ve attached the linings to the wrong side so the hems are actually on the outside but by the time I’d done this, sewing three metres along both sides and a metre along the top and bottom, I couldn’t face redoing them. And who will look THAT closely anyway. The fabric I bought on ebay for next to nothing as well as the lining fabric. And the whole project took me about a week to complete. I’ve bought the fabric to do the same for the sitting room but can’t even face getting the sewing machine out of it’s box. It might be easier just to go to John Lewis like any normal person. My final fabric/wallpaper is this and features Seb as it IS his room. 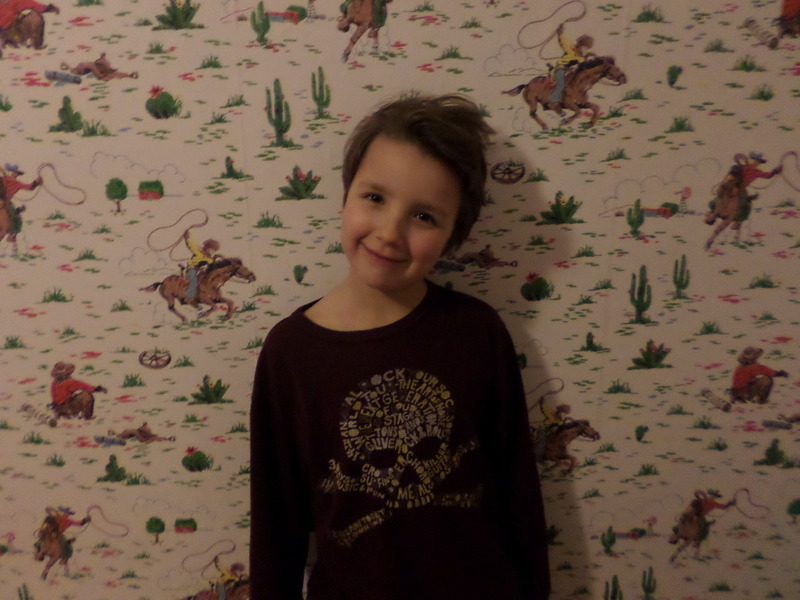 I have always loved this cowboy fabric from Cath Kidston. 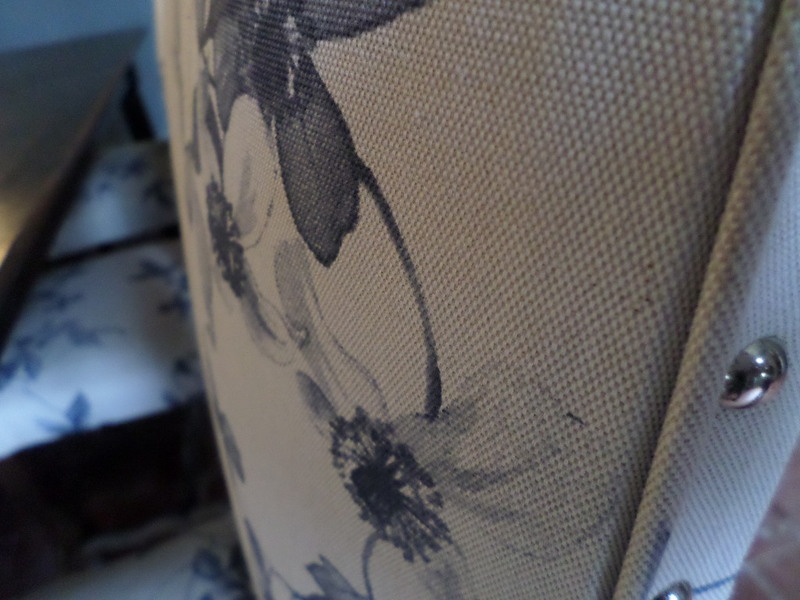 When we bought out first flat together in Balham, London, I bought some of this in the oilcloth fabric to cover some old chairs Peter had retrieved from a skip for our kitchen. I then painted the kitchen to match with green walls and cream cupboards but I had never managed to persuade Peter to use it any more liberally than that. Until now. Perfect for a boys bedroom although terrifyingly already feeling a little juvenile for my growing boys. Arthur has in fact moved out of this room now and into his own more minimalist designed den. And I can’t help but feel that in a year or two Sebastian won’t want cowboys on his walls anymore. And so it is with all children’s room decoration – it serves to remind you that they aren’t children forever. And those sheep cot mobiles, designers guild cat print curtains, and toy wooden forts are but for a fleeting point in time. A time that YOU appreciate far more than they ever will which is no doubt why we spend so long decorating children’s rooms. Mine are happy if they get to put a Harry Potter posted on the wall (posters are strictly forbidden in our home, as are cartoon related duvet covers) which one day, when they leave home they can do. Until then its cowboys and farrow and ball paint colours. But from the look on Seb’s face he SEEMS happy enough with his wallpaper. Until he’s 13 and decides he wants to paint it all black anyway. I soooo love all the work you have done…it’s absolutely beautiful! The dining room looks so cozy, perfect or family memories! Have a wonderful stay! Fantastique as usual! Still fighting jealousy but I’ll manage….